← Cartmel, Home of the Sticky Toffee Pudding. And there we will wallow in glorious mud. These words from the song made famous by Messrs Flanders and Swan perfectly sum up the walk I did yesterday. 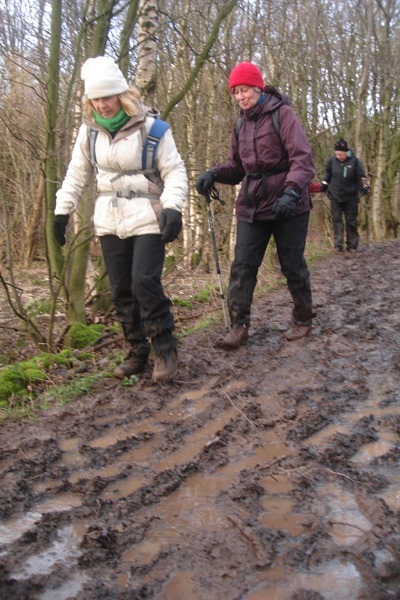 I was out with Crosby Rambling Club and after weeks of heavy rain we knew it would be muddy. The weather forecast was for more torrential downpours accompanied by gale force winds, but it might clear up in the afternoon. Our destination was Scorton in Lancashire on the edge of the Trough of Bowland. Scorton is a pretty little village but is sadly blighted by the roar of traffic from the ever busy M6 which is only a couple of hundred yards away. I joined the ‘B’ party walk led by Ken. We left the village and walked up the hill over the motorway continuing along a quiet lane before branching off to climb to the summit of Nicky Nook. 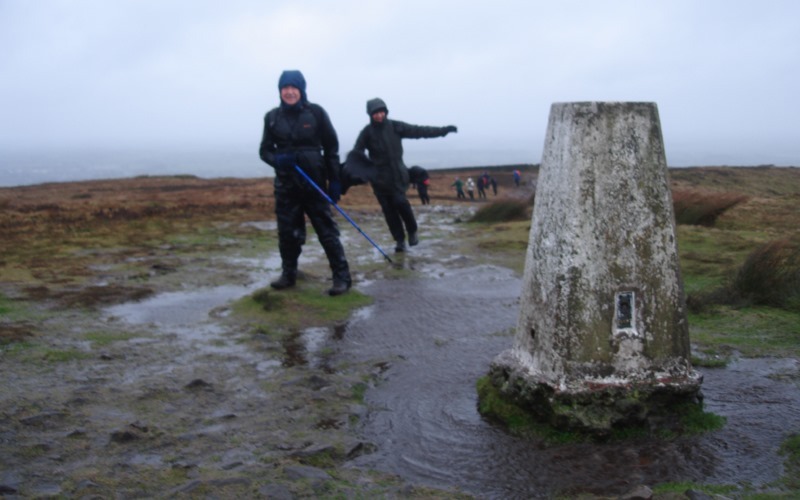 Although only 215 metres in height the view from the trig point at the summit is far reaching. On a clear day it is possible to the hills of North Wales, the Lake District and even the Isle of Man. Unfortunately today was not such a day. The short climb was an adventure in itself. As we gained height we felt the full force of the wind and we were head on into the rain which was coming at us horizontally. At the summit it was even worse and it was difficult to stay upright. I had trouble trying to keep my camera steady and was nearly blown off my feet. Those of you that know me will realise that it takes a big gust of wind to do that. We stayed at the summit for maybe 10 seconds and then descended the steep path down to Grize Dale where at least there was a bit of shelter and a firm track. Our route continued up towards Fell End farm and then a gentle climb towards the moor. 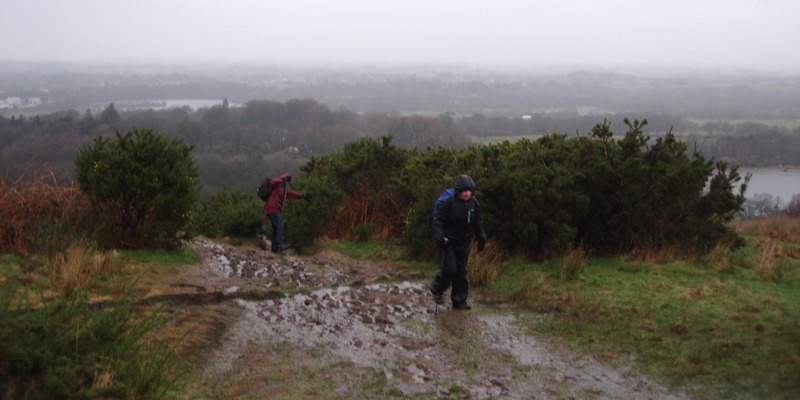 After crossing a minor road we continued on a narrow path across Harrisend Fell. 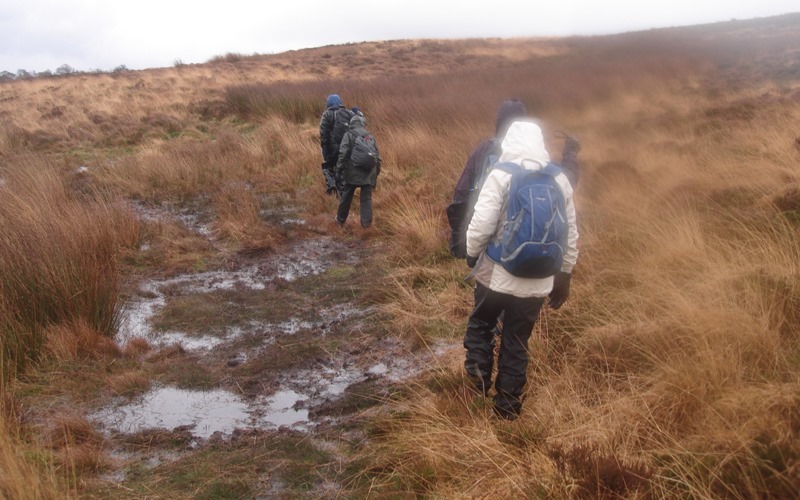 It was tussock grass with boggy bits in between, very heavy going. 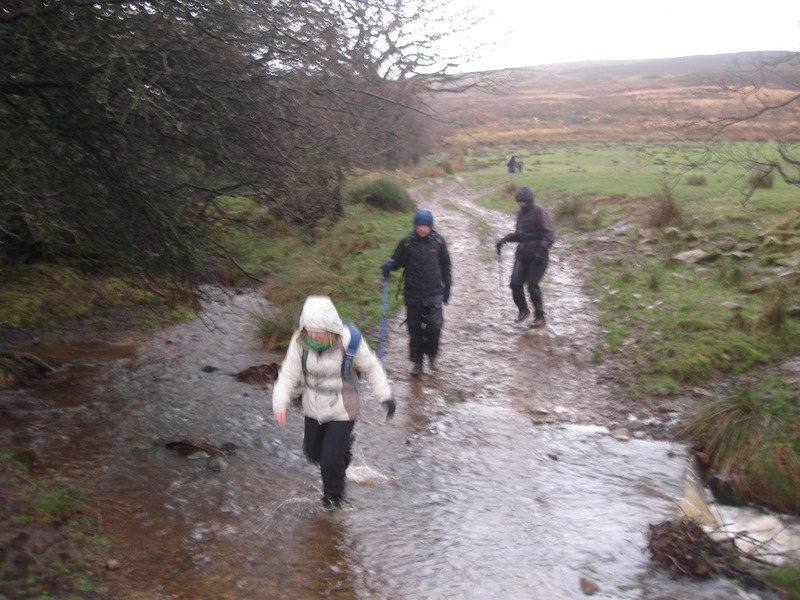 At Foxhouse Brook we descended towards the road and we thought the worst was over. By now we were all pretty wet and even worse my camera was wet, hence the artistic soft focus. Before reaching the road we had to cross a ford, not marked on the map because it is not usually there. At least it gave us the chance to wash the mud off our boots. We crossed the River Wyre at ‘Street Bridge’ and walked along the track close to the river which was just about being contained within its banks. 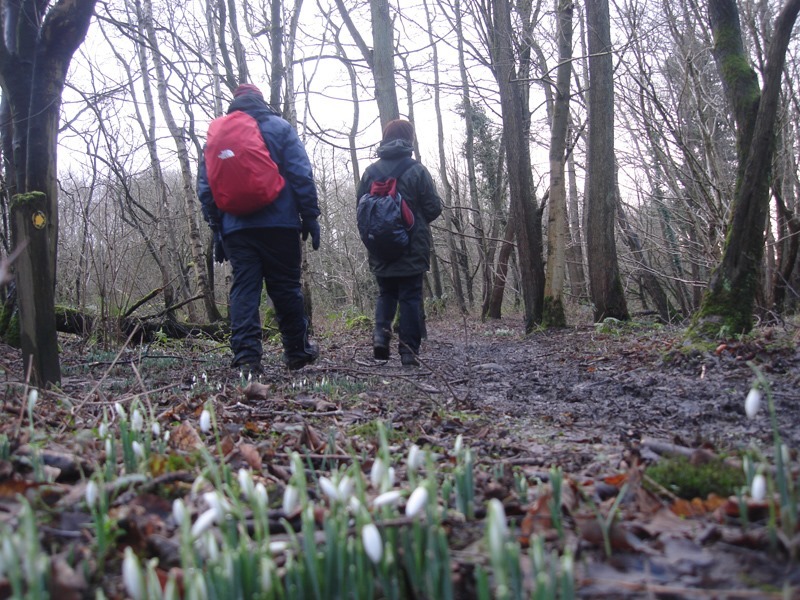 We were on a section of the ‘Wyre Way’, one of the Long Distance footpaths. It follows the river from its source at Abbeystead to the estuary at Fleetwood. 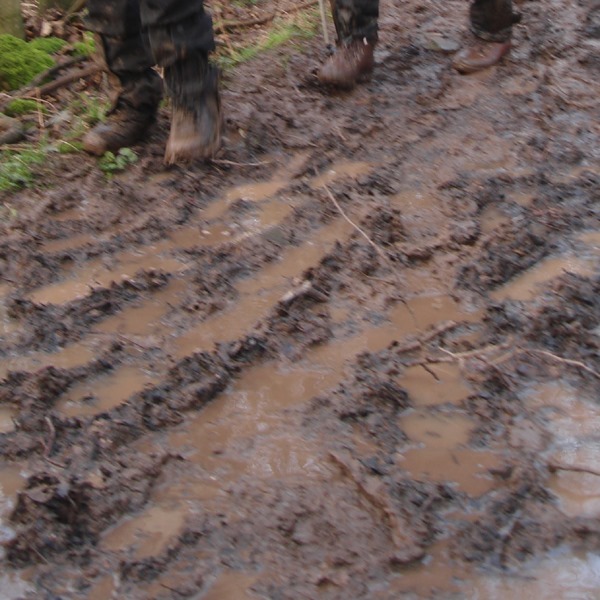 The path wandered through the woods and past the ‘Fishing Lakes’ It was here that we encountered ‘proper mud’. Ankle deep and no way to avoid it. However there were some good points. 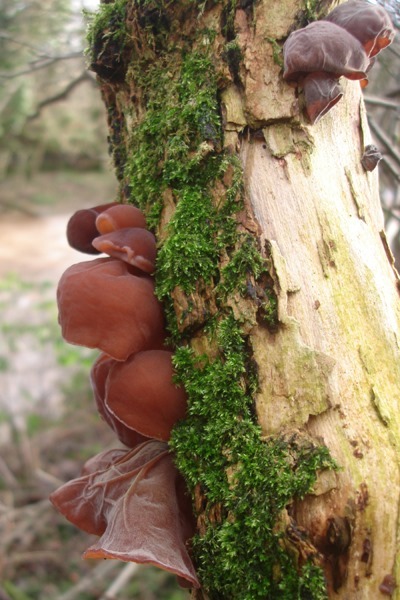 I spotted some fungi and also some clumps of snowdrops, surely a sign that Spring can not be too far away. To get the picture I had to kneel down in the mud but by that time it did not make any difference. I was already covered in mud up to my knees. The only bit of me that was dry was my socks. We re-crossed the busy M6 and then followed the course of the river across more muddy fields back to Scorton. Exactly on cue the rain stopped and the sun came out. After getting changed into some dry clothes we headed for the only refreshment place in the village. It was ‘The Priory’ a cross between a cafe, pub and restaurant. We all crowded in and soon it was standing room only, but it was lovely and warm with a huge log burning stove. Even better was the fact that it sold a couple of real ales. I went for a pint of Thwaites Lancaster Bomber. A beautiful chestnut coloured ale with a malty aroma and full of flavour. 4.4% ABV.Superb. It had been another adventure but I wish it would stop raining. 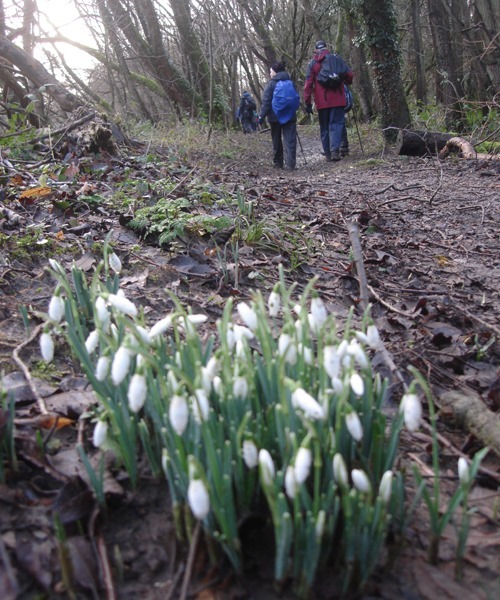 This entry was posted in Lancashire, Sunday Walks. Bookmark the permalink.